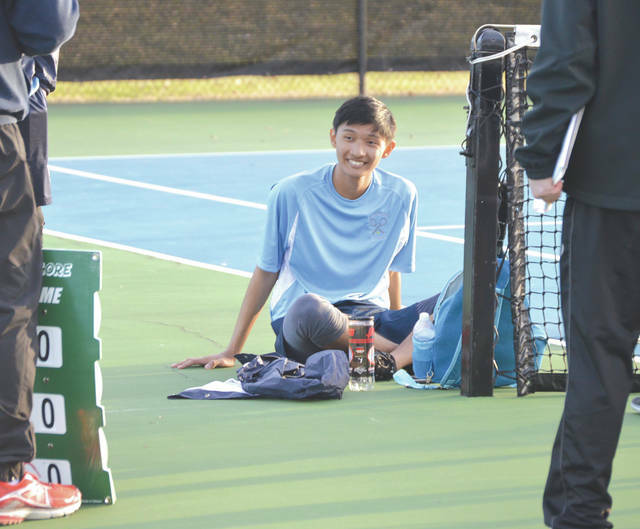 Fairborn’s Janiel Buita smiles and rests moments after winning the decisive match at third singles, to give the host Skyhawks a 3-2 team win over Middletown, March 27 at Community Park in Fairborn. 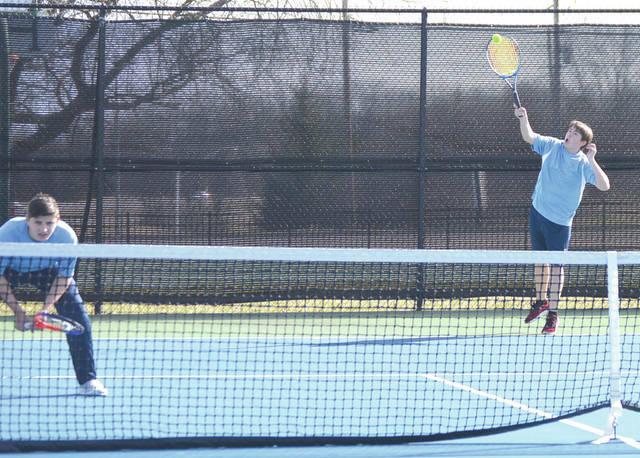 The Fairborn freshman-sophomore tandem of Wylie Parker and Sam Streck battled to a 7-6 (7-0), 6-4 win at second doubles, March 27, at Fairborn’s Community Park. 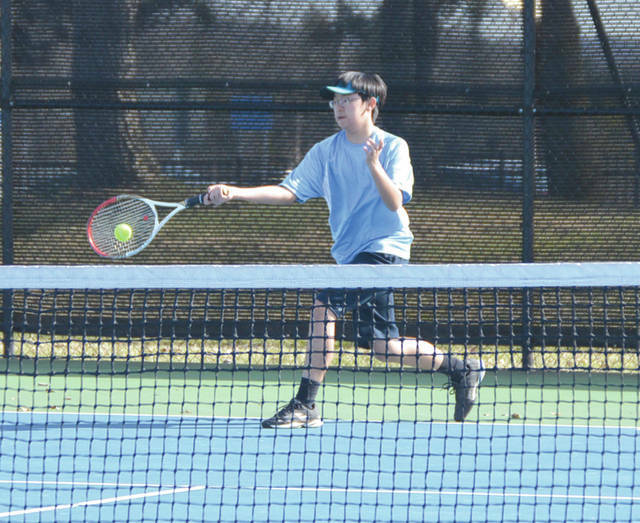 Fairborn sophomore Nghi Nguyen hits a baseline ground stroke during his match at first singles, March 27 at Community Park. 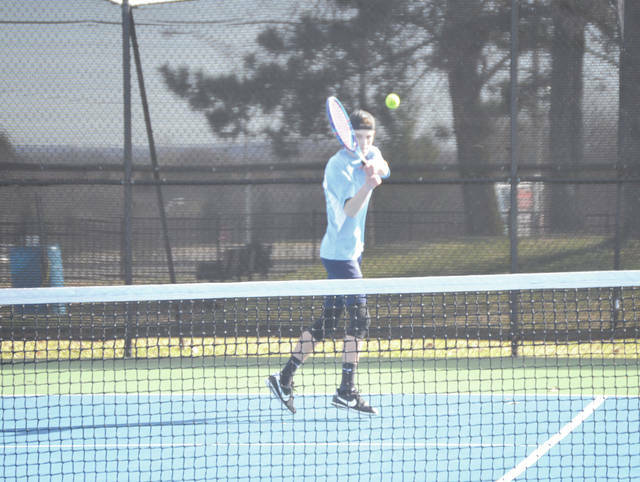 Skyhawks senior Caleb Smith follows his backhand shot, March 27 in a straight-set win at second singles. FAIRBORN — Fairborn head tennis coach Doug Coy said he aged a bit from watching Wednesday’s boys high school tennis nonleague nail biter with visiting Middletown, but the fourth year coach was smiling after his Skyhawks rallied for a 3-2 team win, March 27 on the Fairborn Community Park tennis courts. Three matches into the 2019 season, Coy says he’s already excited to see his team coming together. “This is the first year that I’ve been here where we’ve actually had kids coming back that we knew we could count on,” Coy said. “We had four kids who were first-year players last year, and they’ve played all summer and have really developed their games. And during last season, they won five matches. That’s the most matches we’ve won since I’ve been here. They played all summer long, and we’ve added some foreign exchange students with good skills as well. One of those “good kids” is junior righthander Janiel Buita, who reeled off a 6-1 first set win at third singles, then lost his focus and nearly lost the second set to Middletown’s Jacob Brown, before rallying from 1-4 down to win the deciding second set 7-5. Senior Caleb Smith claimed a 6-4, 6-3 win at second singles over Middletown’s Junior Tuscano, and the freshman-sophomore tandem of Wylie Parker and Sam Steck battled past Middies Angel Rivera and Alex Chairez 7-6 (7-0), 6-4 to win at second doubles. Middletown’s wins were by Deniz Misirlioglu at first singles, 6-0, 6-o over Fairborn sophomore Nghi Nguyen, and the Middies first doubles pair of Michael Langendorf and Troy Virson, who rallied to a 6-1, 3-6, 6-1 win over Skyhawk sophomore Silas Smith and senior exchange student Theophane Pradelle. The Middies are now 1-2 overall this season. They’ll begin Greater Miami Conference play on Tuesday April 2 when they’ll play host to Cincinnati Colerain. Coy said Buita’s battle at third singles was tough for himself and returning coach Terry Miller to watch. Fairborn is also 1-2 this season. The Skyhawks head north to play Troy at 4:30 p.m. on Thursday, March 28. Then, the Skyhawks return to Community Park on Friday to host Dayton Christian. DC won the season opener between the two schools back on March 22, but Fairborn was without its seniors who were in New York City on a Senior Trip. A year ago, Fairborn also won its first match after two opening loses. They then lost their next seven matches, then won four of their last six to finish at 5-11 overall. The team’s goal is to win more than five matches this time around.